Last weekend i went down to Busselton for the spring running festival and ran the marathon. Luckily it didn’t rain witch is what I thought was going to happen it was a bit windy as can be expected when your right on the coast, but the track was flat and for half of the course i had the wind behind me making it fairly easy for those parts, however it was a different story on the way back because we had to run dead against it. By the time i came back for the fourth lap most of my strength had been drained, it was tough pushing against those kind of head winds, it did give me a good understanding of what to expect while running coastal events for the future. There were a few little spots where there was sand on the track not a huge amount but i wasnt expecting it and it was a bit hard rolling threw it, there was a man with his sons standing close by watching the event as we all ran past and when they saw me struggling to get threw it went out of thier way to make it easier for me and had cleared the worst bits by the time i went threw it the third time. I was really thankful for thier help, they made my morning, its great to see that people can be so helpful. By then i could feel myself running out of stamina it was fairly windy when we started it was a four lap course and the wind got stronger and stronger right up until the finish, we started with the wind and came back against it on the way back and every time we did another lap the wind got stronger and it was harder and more difficult, i really struggled on the last lap. I was really hoping of a sub four hour run but ended up with four hours and four mins, a 42.2 personal best so far and im very happy about it, it might have been a bit quicker but at the start everyone ran a couple extra hundred meters, from the direction signs being wrong until someone figured it out. When I got to the finish i ran down the wrong side of the fence so i had to go back and take the right path over the line. It wasn’t a huge turnout, in fact its the smallest event id been to. Not that iv been to too many, but the people there were really friendly and very supportive and it was also great to see a lot of familiar faces who always look happy to see me out there, i think thats why im usually smiling while running especially when they egg me on and help me to keep up the pace. There’s no doubt about it that my time would have been slower had it not been for thier encouragement. 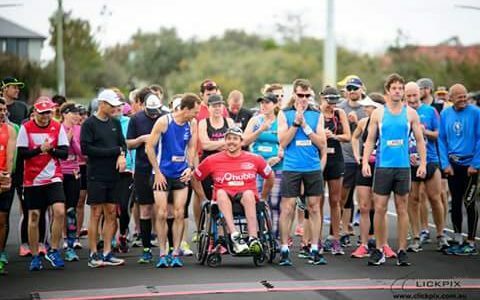 This weekend il be running in the 21.1 km event at the fremantle running festival and i imagine the conditions will be very similar if all goes to plan im hoping for a 1h 50m time frame fingers crossed that i have prepared enough for it.